W37 "architectural project - by the architect Monica Melotti, Chief Design Officer of MBAmerica - has transformed a historic abandoned industrial area in Milan into a place of contemporary design where past and present coexist in harmonious balance." 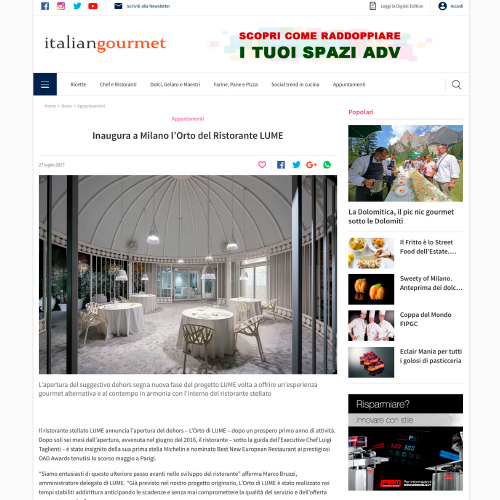 Thank you Interni Magazine for telling about our project and business, from the residences to the venues for private and public events as well as Michelin-starred restaurant LUME. The press conference to present the new W37 Living project took place yesterday in Milan. Monica Melotti, Chief Design Officer of MB America, was the protagonist in the building site, of an unusual breakfast, made by Michelin-starred chef Luigi Taglienti. She explained to design and architecture journalists her project's vision and the last tranche of investment for the construction of the new apartments on the second floor. 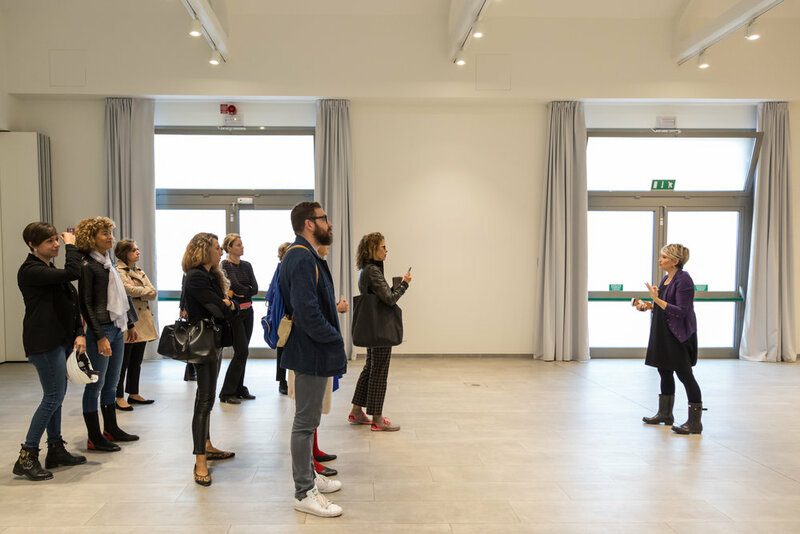 A guided tour of the complex concluded the visit of all the different areas of W37, from the Living to the Venues, without forgetting our renowned LUME restaurant. 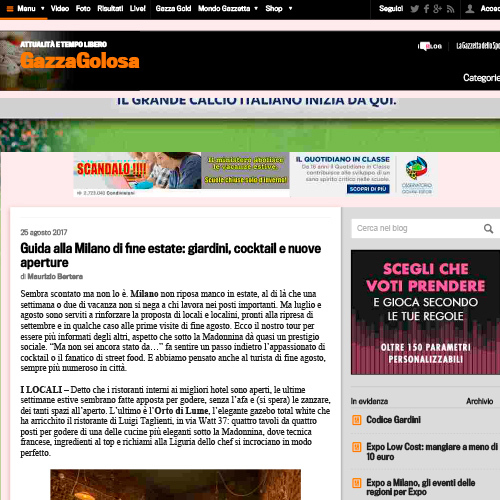 LUME Milano ranks among the top 10 restaurants in Italy for internet and social media's strategies. 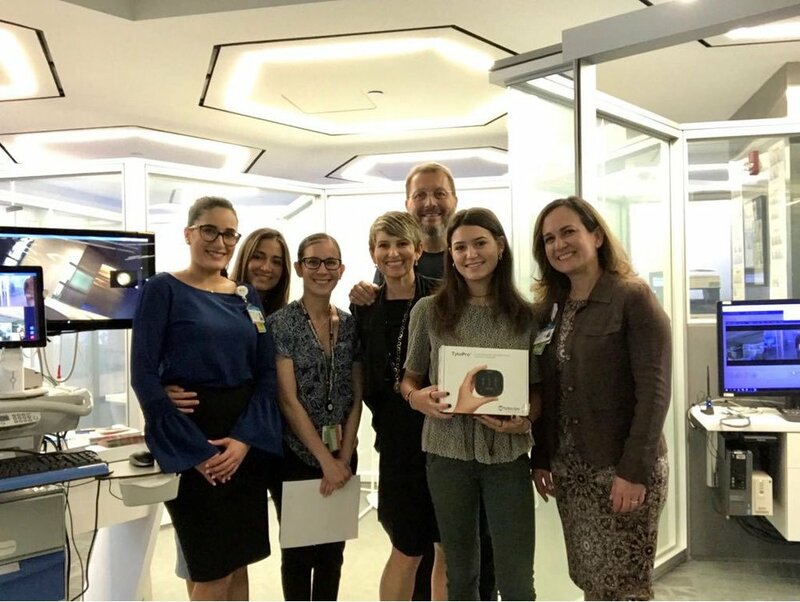 We are so grateful that The Italian Data Flavor - the first research of this kind in Italy - recognized the efforts of our and LUME's team! Congratulations to the other restaurants that made it to the list. MB America’s CEO, Marco Bruzzi, and the company’s Chief Design Officer, the italian architect and interior designer Monica Melotti met Designer and Craftsman Luca Porcelli at the 93 Palm mansion back in 2016. From this encounter they came up with the interior design idea to have "ART IN ART" where Luca Porcelli could express his art with an installation of unusual and unique objects in an unusual unique location – 93 Palm – objects that through their rareness could highlight the rareness of the house. All pieces made by Luca Porcelli are completely handmade using precious material. His functional art reveals the evolution of his aesthetics pushing to a further level his pleasure in transforming home space into a sophisticated playground. Focusing on the quest for beauty and opulence through deliberately hazardous yet sublimely refined colour combinations, the use of the finest materials, and the most traditional crafting techniques, Luca Porcelli expresses his own amusement and amazement for the infinite ways of infusing art and uniqueness into something unexpected. Everything was designed to leave intact the "historical flavor" of this unique property. The collaboration is now featured in the latest edition of Décor Year Book, the interior design book the showcases the latest trends and international, cutting-edge interior design projects. When business ingenuity meets creativity, great things happen. Sky filmed its latest commercial promoting its next generation Sky Q technology at W37 Venue. For the occasion, the space managed by MB America was transformed into the stylish house of Italian presenter and actor Alessandro Cattelan. CBS Living Large’s Lisa Petrillo, South Florida's premiere Entertainment Reporter, takes a rare look inside 93 Palm after its complete renovation and listing, and interviews MB America’s CEO Marco Bruzzi. On May 5th and 6th, MB America’s W37 took part in Open House Milano, the exhibition that opens the doors of locations representative of the architectural heritage of the city, to which there is normally limited public access. Over 30,000 visitors participated in the 3rd edition of the event and discovered the architectural treasures in Milan across the entire city. 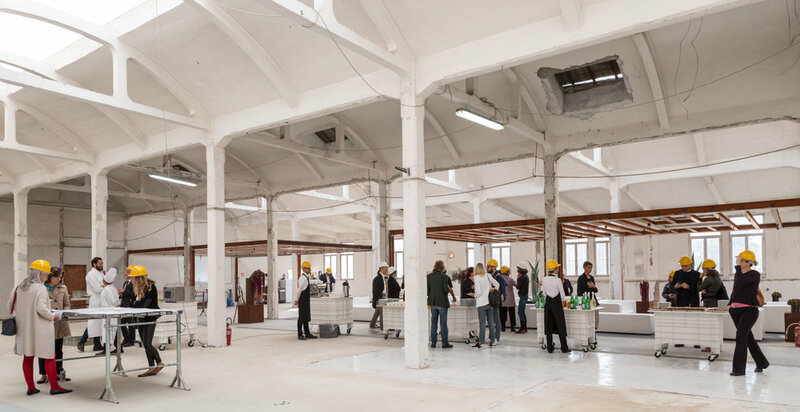 In an itinerary that shows the re-qualification and upgrading of former industrial sites, W37 opened its doors for the first time and welcomed nearly 1,000 visitors. 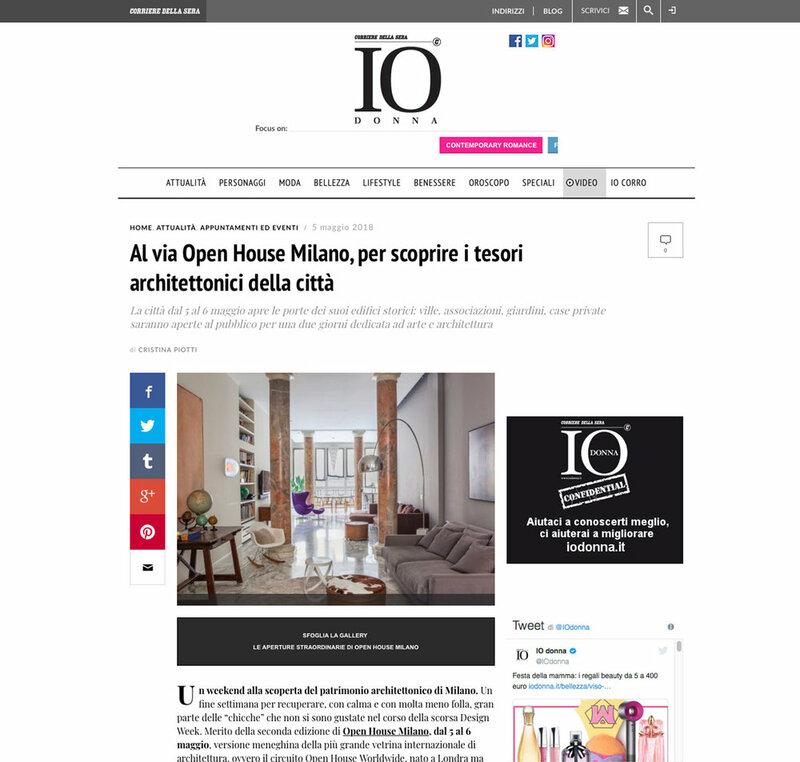 Open House Milano will be back in 2019, on May 11th and 12th. Wealth management and investment firm MB America invites you to take a special, virtual tour of former Al Capone mansion in Miami Beach. Enter into an intimate world of elegance and beauty, and let the city dissolves away. Enlighten your senses in this magnificent waterfront, Palm Island mansion. Enjoy the pristine Biscayne Bay views, the utmost privacy and the timeless grace of this one-of-a-kind residence, renovated by MB America. This is everything you need to treat your senses and feast your eyes. 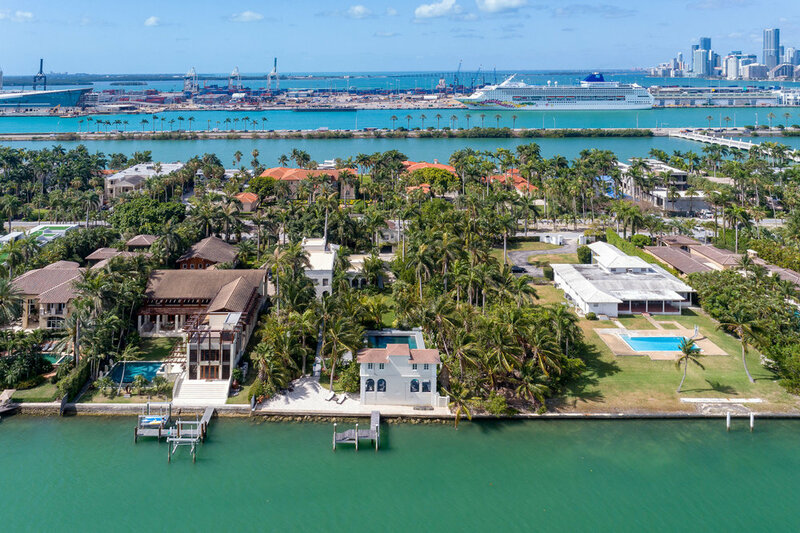 MB America announces that former Al Capone’s mansion in Miami Beach is on the market through top-producing Senior Vice President Nelson Gonzalez of EWM Realty International. 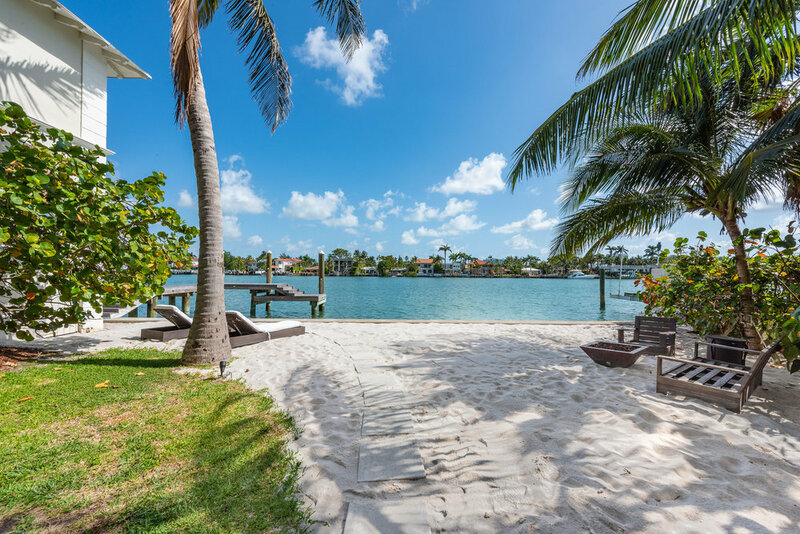 Waterfront located on the private, gated Palm Island community, the 7 bedroom, 5 full bathroom and 2 powder room property - renamed 93 Palm - is one of Miami’s oldest and most famous estates. 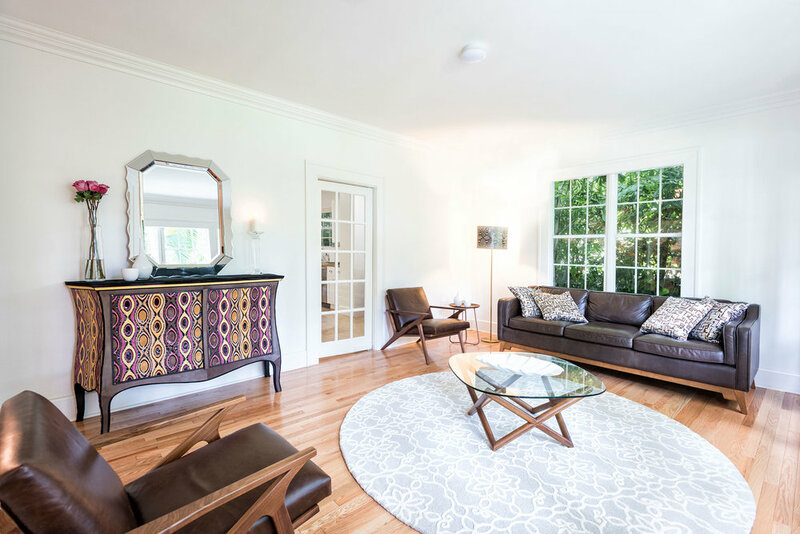 To discerning buyers looking for pristine privacy and timeless grace, 93 Palm offers the desirable combination of strong investment security, glamorous potential and historical value. "93 Palm has been a landmark in Miami Beach for more than 90 years. We have been particularly respectful when working on this heritage building and we are proud that we rescued it" said Marco Bruzzi, MB America CEO. "93 Palm represents the rare opportunity to own a slice of American history". Built in 1922, prohibition-era gangster Al Capone bought the property in 1928 to make it his sunshine retreat. In 2014 MB America acquired 93 Palm on behalf of a private investor. To rescue it from a state of progressive deterioration, MB America contracted a Boston-based team of experts in restoring and rebuilding heritage buildings. After 6 months of intensive work, a team of 50 people led by MB America brought 93 Palm back to its original splendor in record time. Today, 93 Palm is a private property which has been featured in a wide range of TV programs and documentaries, and has hosted photo/video shoots, events, movies as well as products launches. "When restoring 93 Palm, we wanted to remain true to the property’s era and existing architecture," said the Italian architect Monica Melotti, MB America Chief Design Officer. 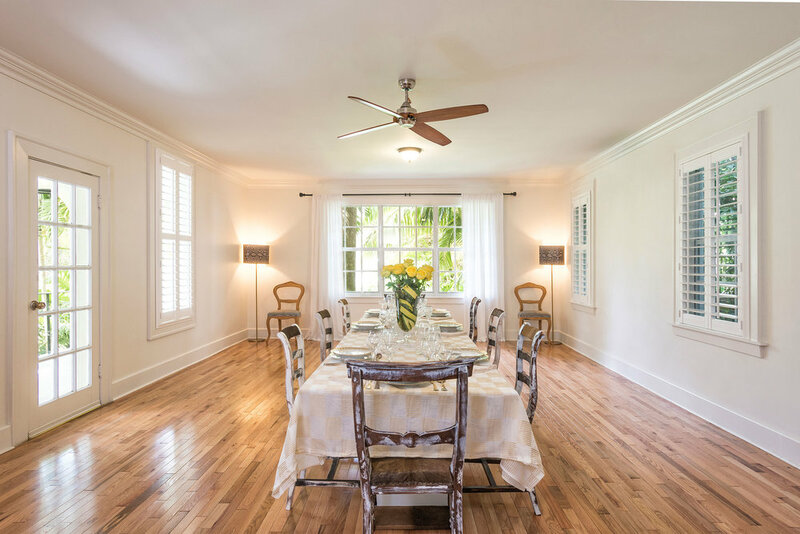 "While the estate retains its original characteristics and heritage, we reinforced its infrastructure and selected design elements that offer a historical context with a 21st century twist. The final result gives a refined sense of modern elegance combined with an old world charm". 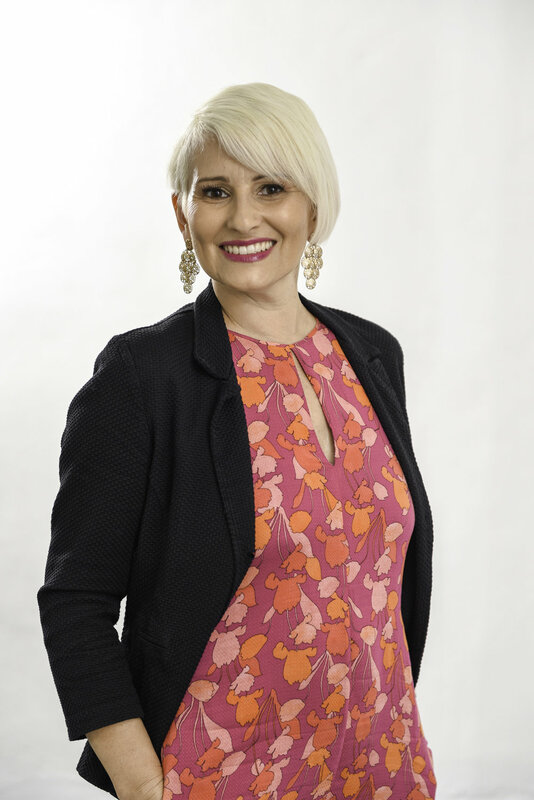 Miami Magazine, a US high-end luxury lifestyle publication, honors Monica Melotti, MB America co-founder and Chief Design Officer, in "a selection of women who are dynamic leaders in their field", women of distinction who "are truly accomplished and stand out as influencers and contributors in the Miami community", according to the magazine. 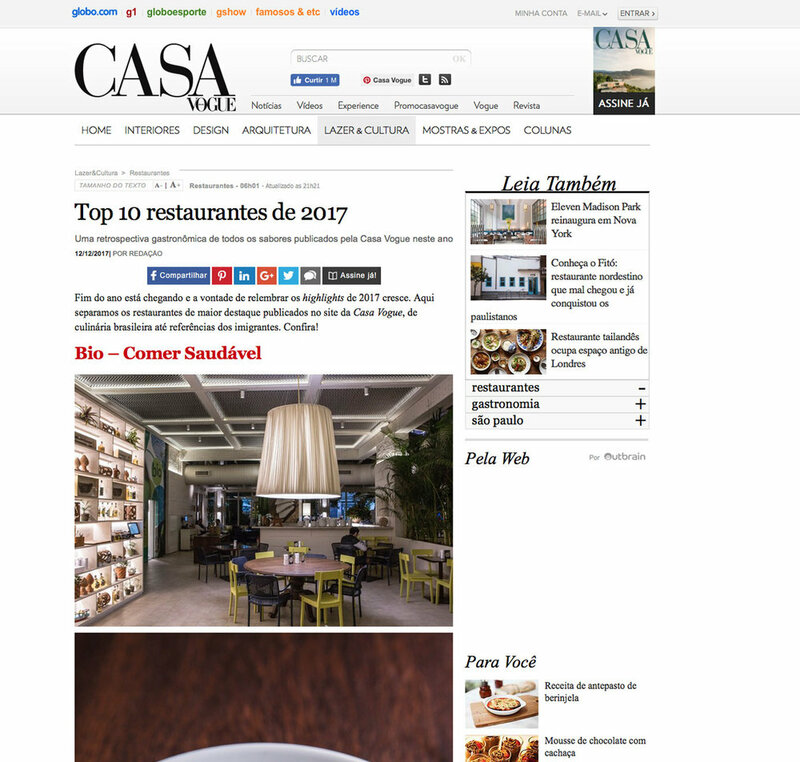 Leading interior design and lifestyle magazine, Casa Vogue Brazil ranks MB America's LUME among top 10 restaurants in the world. "Everything seems to be done in oil on canvas, however, the art is to be touched and tasted" write the critic about Marco Bruzzi and Monica Melotti's project, the only Italian restaurant to be named in the list. "The new outdoor area is a brilliant idea, it seems to be in a romantic hotel out of town [...] A rectangle surface measuring 160 square meters, a total white aviary-shaped structure, ‘sanpietrini’ tiles and Liberty-style decorations, then the ‘cage’ used as a container: compliments to the architect, Mrs. Monica Melotti." 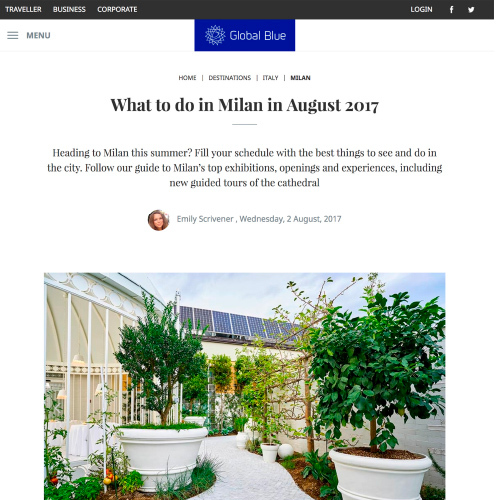 – writes Dominique Antognoni in ‘The Good Life’, a magazine about business and lifestyle, after visiting the new Orto by LUME, and continues: "Mr. Taglienti has a firm and delicate hand, sure and fine, he offers a cuisine in constant evolution, chromatic and creative, he has a very outlined personality". 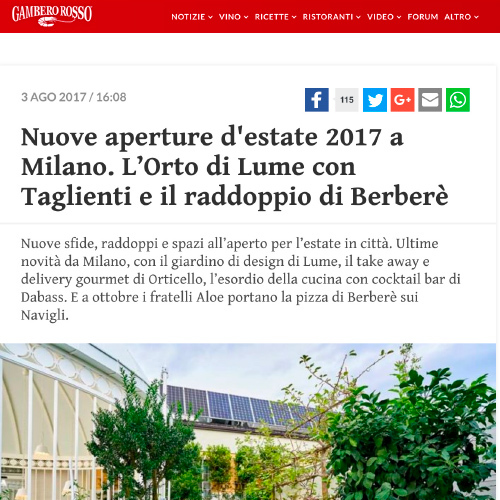 Two months after its opening, we are pleased to share with you a selection of the most significant press clippings featuring the Orto di LUME. 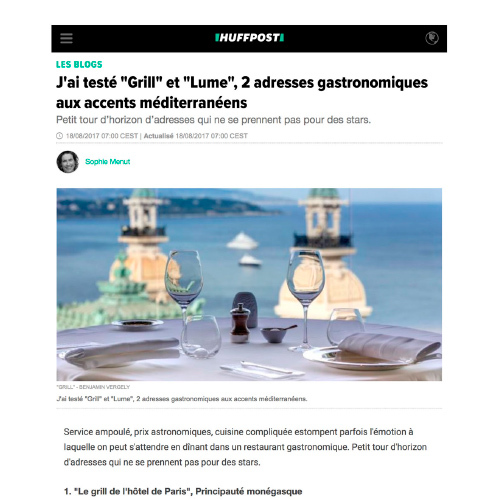 “An innovative business model brought (LUME) a (Michelin) star...” writes MAG Magazine in a dedicated article featuring an extensive interview to MB America CEO Marco Bruzzi and LUME executive chef Luigi Taglienti. 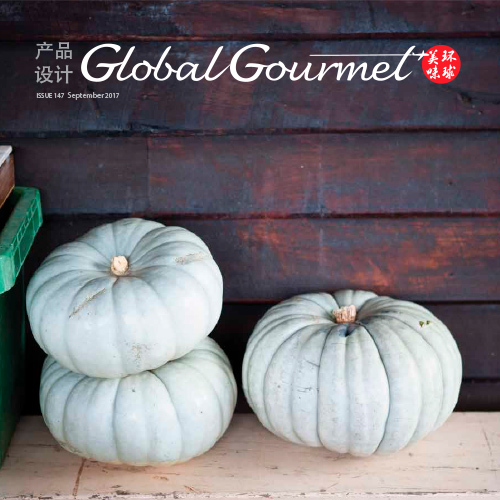 ViviMilano-Corriere della Sera nominates LUME for the ViviMilano Food & Drink Awards in the haute cuisine category for its harmoniously balanced culinary creations from premium raw materials. Click through to the voting page by Friday May 12th and vote for us with one simple click.